Homemade Hot Sauce! | I made that! totally worth the heart burn. I can’t wait to make a batch! Oh, how I would love to try this. Oh. I’ve been experimenting with hot sauce too recently! A thicker version though, more like a Spanish “Salsa brava”. Right now I have a pork shoulder slow-cooking in the oven, I might need some of the hot stuff! Just reading about it is making my mouth feel hot! 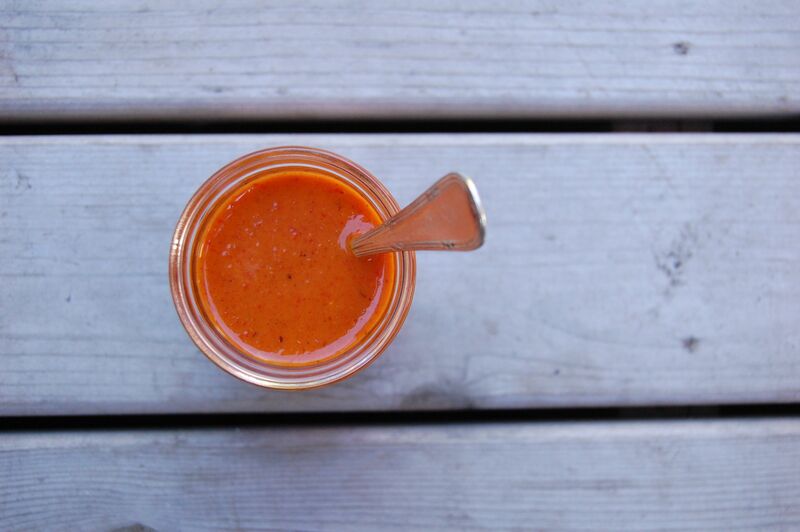 I am kind of obsessed with hot sauce of all kinds, and this one looks so good! And I love how easy it is! 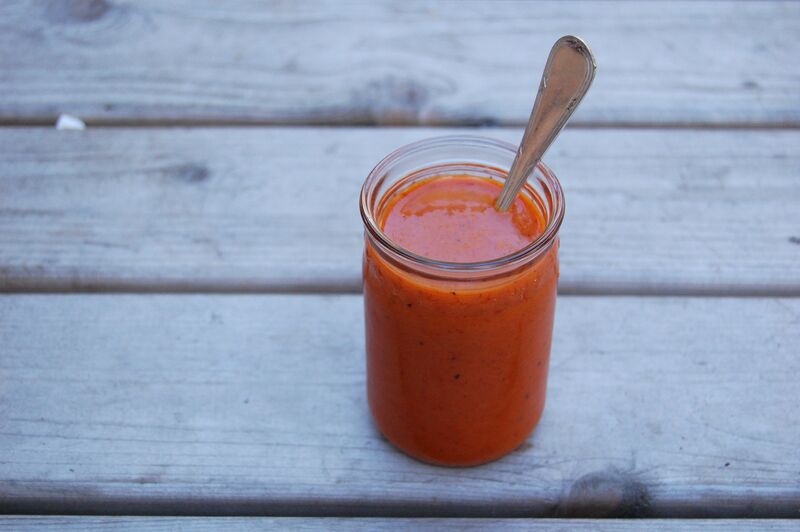 It is amazing on how easy it is to make your own hot sauce. I love Youk’s! But even more, that you totally problem-solved. Bummed that I didn’t make it to Seattle, but you saw those mountains that got in the way. 🙂 Someday, for reals, I will be up to visit the Pantry at Delancey. So inspired by what you guys are doing. Woohoo! I am seriously so excited. My husband is a hot sauce connoisseur-no joke. He loves Tabasco, Frank’s Red Hot, and Tapatio. I had to retrain him to try my food before dousing it! I pulled out a recipe for homemade hot sauce from Saveur about a year ago, but, *sigh* haven’t made it yet. I can’t wait to try this one! Thanks! I love your post. I´ve been on a big homemade hot sauce kick too– it´s what seems to happen when you live in a country where you can´t find the bottled stuff. Same technique, just with the little tiny hot peppers. Also, I know it´s been awhile since you posted on it, but I´ve been loving your cabbage peanut salad! It had never even come across my mind, making home made hot sauce. But somebody had to have started making it at some point, you know? Fantastic idea! This looks great! I love making things that you usually buy at home. I just found this site and amd already crazy about it! I love that you have things that you would never think to make your own homemade! GREAT JOB! Oh man!! Bring on the heat! and came to Seattle via New Orleans. a requisite plate of sliced tomatoes and onions to be passed around the table as well. My Sweetie made hot sauce yesterday. Didn’t roast the peppers but we did cook them up with garlic and such. Used the blender to puree and vinegar to get the right consistency. 4 habs, 5 infernos and I think three cherry bombs. Looking forward to enjoying in a week with wings. This has happened because the store bought based for our hot chicken wing sauce is no longer available. Mmm sounds good! 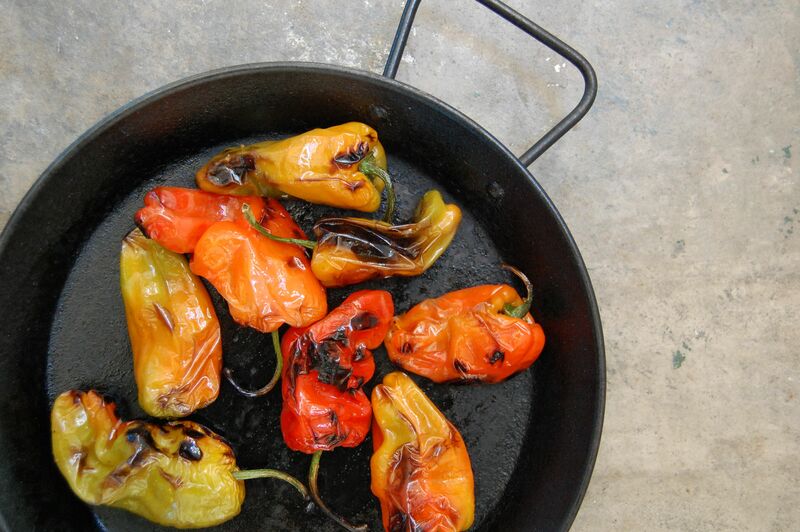 Do you skin the peppers after roasting or does the whole lot go in the blender? I just throw everything in and strain the skins out. Good luck! I have just discovered your blog and am traumatized…..where have you gone? Your recipes are inspirational…I just posted two gratins and now I must try yours! Please come back! How many oz. does this recipe make? I happened on this site just in time. I was just given a quart size bag of tiny red chili peppers. I’m not sure of the variety but they are seriously hot (they range from about 2 inches to about 4 inches in length and are quite slim). I’m wondering if the same technique would work with these hot little gems? I think I’ll give it a try – what the heck! Sounds kinda like the true southern recipe my great grandfather taught me when I was a kid. He would hickory smoke his peppers in the smoke house with the hogs. His had tomatoes added. We also let the stuff age for at least a year. He been gone since 85 and I still have some bottles of his that makes this new stuff with ghost peppers look like water. Our peppers are a custom family hybrid tho. This looks wonderful, can’t wait to try it! I made this last night. Great simple recipe.